Grilled Asparagus is simply delicious and the addition of portabello mushrooms and this marinade make them to die for! Combine ingredients in an airtight container and allow to marinade for at least 2 hours. Place the marinaded vegetables directly on a lightly greased grill. Cook rotating occasionally until the vegetables are tender, 8 to 10 minutes. 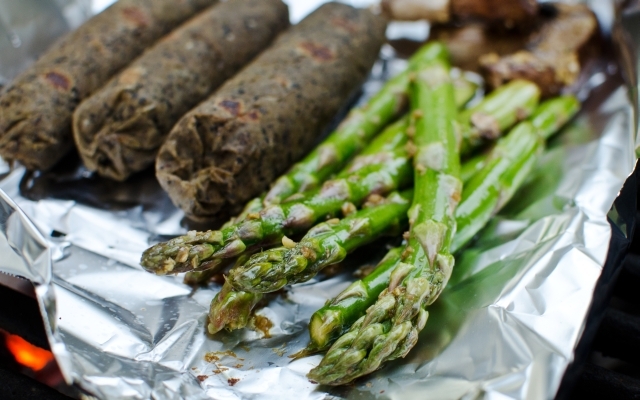 Note: If your grill is of questionable cleanliness or you are concerned about loosing a few asparagus lay a square of tinfoil on the grill poke it with a few small holes to allow some smoke to come through the surface, and place your vegetables on the foil.